Threadless Internal Cups, Straight 1-1/8"
To run the forums, host the website, and travel, I charge a universal service fee for my reviews. This review was sponsored by Velec, which is a Canadian company that has been selling custom trikes in Canada since 1993. My goal is to be transparent and unbiased, this video and written review are not meant to be an endorsement of Velec or Trivel products. 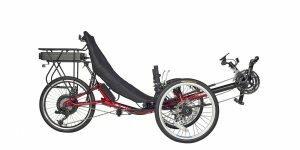 The E-Azteca is a recumbent trike in delta configuration, meaning it has one wheel up front and two in the back. It steers easily and is comfortable to mount because the seating position is somewhat elevated. 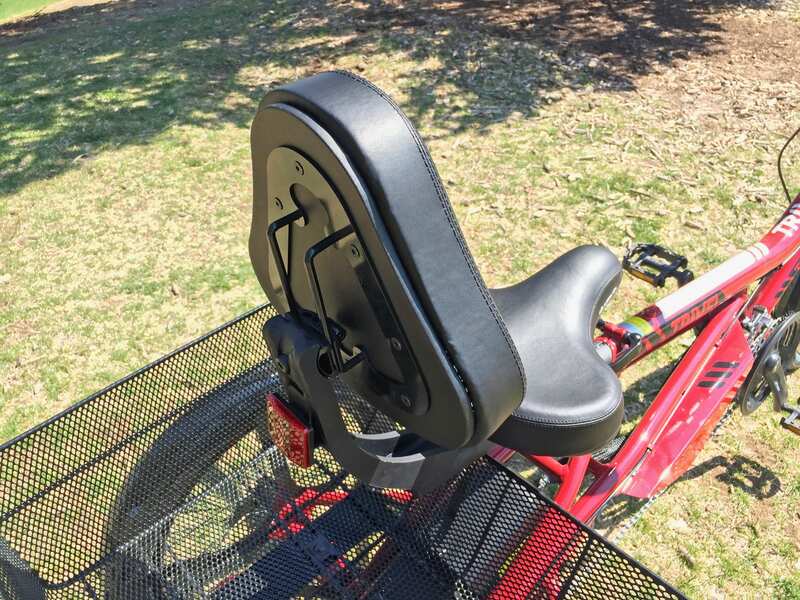 A telescoping stem and seat boom accommodate riders of many heights, and the large comfort saddle with adjustable backrest offer back support. 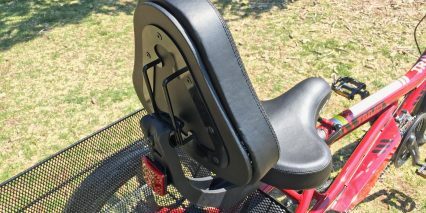 I’ve spoken with many older riders, and some heavier riders, who really appreciate having a back rest like this. 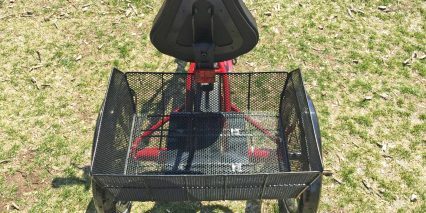 I was impressed by the optional mesh basket, because it offers lots of space for hauling supplies without blocking the seat and backrest too much. I believe that Trivel partnered with another Canadian company called Velec to produce the E-Azteca because the motor has their label. 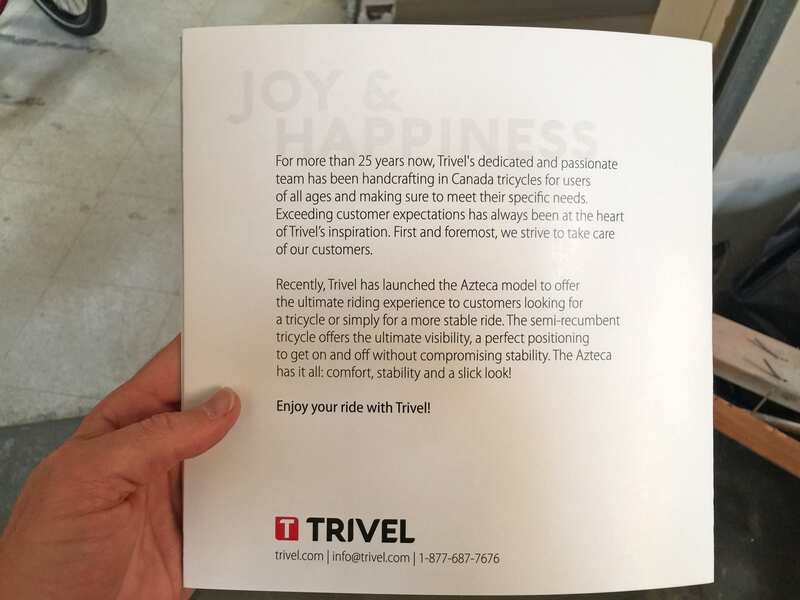 I’ve covered several other Trivel models independently, and feel that they offer good value and some unique drive system options. 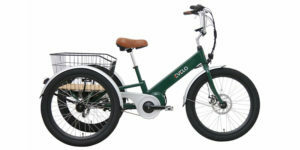 Electric trikes, like the E-Azteca, tend to cost more because they require more materials and might not sell in high quantity. In my opinion, the $3.7k price tag is pretty reasonable… especially if you get it at a shop. 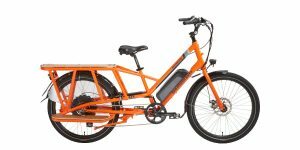 I visited a store called Best Electric Bikes in Denver Colorado for this review, and enjoyed their help fitting the bike. While it only comes in one frame size, the two color options (maroon or white) were great. Some of the accessory and design choices that really set this product apart in my mind include a bottle cage mount on the front of the stem, a battery that is positioned low and protected (below the basket if you opt for that), premium Schwalbe tires with reflective sidewalls and puncture protection, three plastic fenders that didn’t rattle much, and a sturdy alloy chain cover. For those of us with limited storage space, the stem can fold down… but be careful when doing so, because the handlebar can bang into the top tube and scratch the paint or possibly hurt your fingers. This happened to me during review prep and surprised me… because the bar was heavier than expected. And that’s one of the big trade-offs, this trike just weighs a lot. It’s about 78.5lbs but you can reduce that by ~6.7lbs by removing the battery. Doing so requires a bit of reaching and bending down, especially if you’ve added the basket. 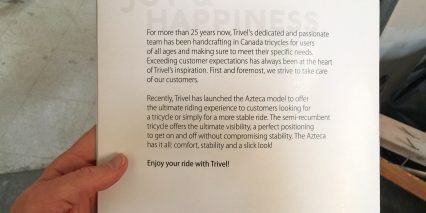 Trivel sells another model called the E-Fat Azteca that weighs even more, and has the same battery integration. I like how fun and comfortable that model is, but feel that the efficiency and narrower design of this one could be more practical in some situations. 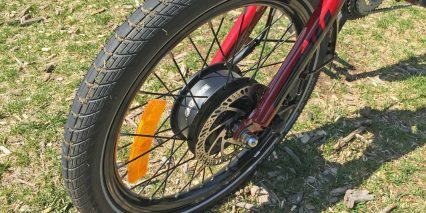 Driving the bike is a Velec branded 350 watt planetary geared hub motor, spoked into the 20″ front wheel with extra-thick 12 gauge spokes. The motor gets a mechanical advantage because of the wheel’s smaller size, so it feels pretty zippy. Perhaps the company could refine how power ramps up on the future, because I experienced wheel spinning very frequently on pavement, dirt, and grassy surfaces. This didn’t happen as much with the E-Fat model because it has wider 4″ fat tires that have knobby tread. My approach to reduce spinning was to lower pedal assist or use the twist throttle. The motor is black, which matches the spokes and rims, and has a little power cable running out from the right side. This cable seems a bit vulnerable to me, because it could get bent or snagged when parking or passing near tall obstacles. This is not a unique issue, but one that some companies have resolved by adding guards and different routing configurations. With the E-Azteca, the wire just sticks out in a big loop… so be extra careful with it. 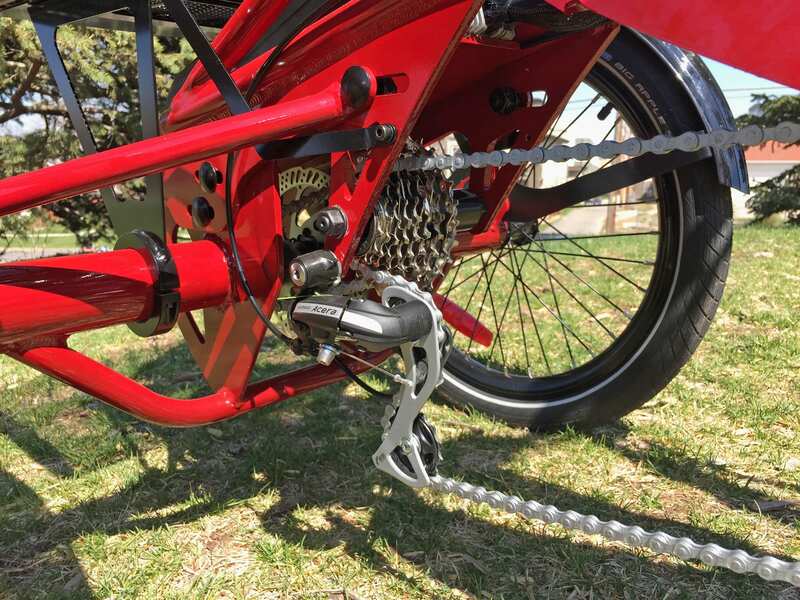 I was glad to see little torque arm washers meant to help distribute energy evenly into the fork vs. just the dropout, and the fork material is steel, which is tougher than aluminum alloy. Being geared, this motor does produce some zipping whirring noises, especially under full power. You can hear this in the video review above. The human powered drivetrain offers 24 speeds, which is more than I feel is necessary. There are three chainrings up front vs. just one or two, but the cassette is limited with 14 to 28 teeth vs. something like 11 to 36 or 42. 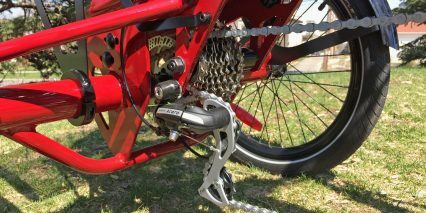 In short, you have the weight and increased maintenance of a second derailleur so that you can have smaller steps between gears and empower riders to pedal more comfortably. But, this is an electric bike… and the top speed is 20mph (possibly 15.5mph in some geographies) so the range of high gears is less important. Even if the bike could top 20mph with motor power, would you really want to? 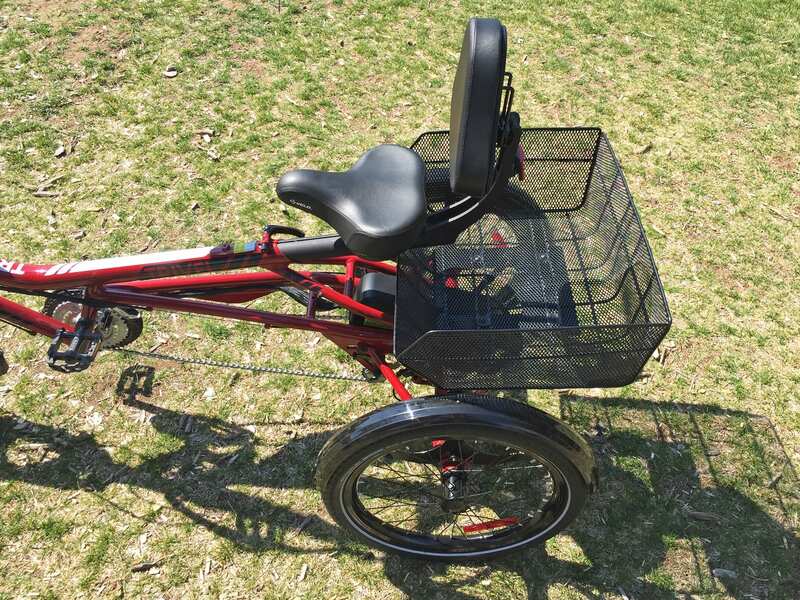 I was able to get this trike up onto two wheels by turning sharply at just 5mph. I’m not saying that the bike is unstable or anything, just that the drivetrain isn’t optimized for electric, in my opinion. 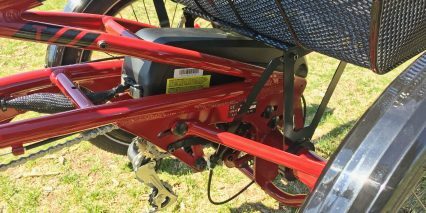 The consequences are extra weight and maintenance as well as additional shifters and clutter up at the handlebar and stem. 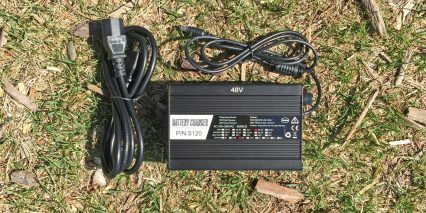 Powering the motor and large backlit display panel is an average sized 48 volt 10.4 amp hour Lithium-ion battery pack. 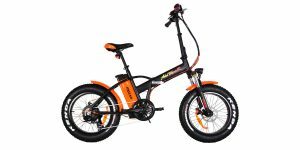 This pack is interchangeable between the E-Azteca and E-Fat Azteca, so you could buy a pair of bikes and loan batteries back and forth for longer rides or use in different conditions. 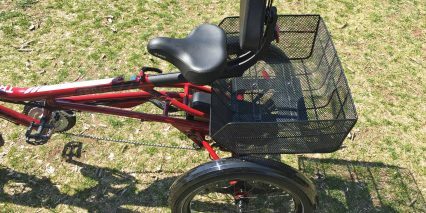 I love that you get a faster-than-average 3-amp charger with these trikes, and that it isn’t too large or heavy. I would always take this charger along with me on adventure rides, or anytime where my plans might change, so I wouldn’t get stuck pedaling all the way back home ;) Unlike many upright trikes, you can get excellent leg extension here, and reduce thigh chaffing (even with the larger saddle) because of the recumbent foot-forward pedaling position. 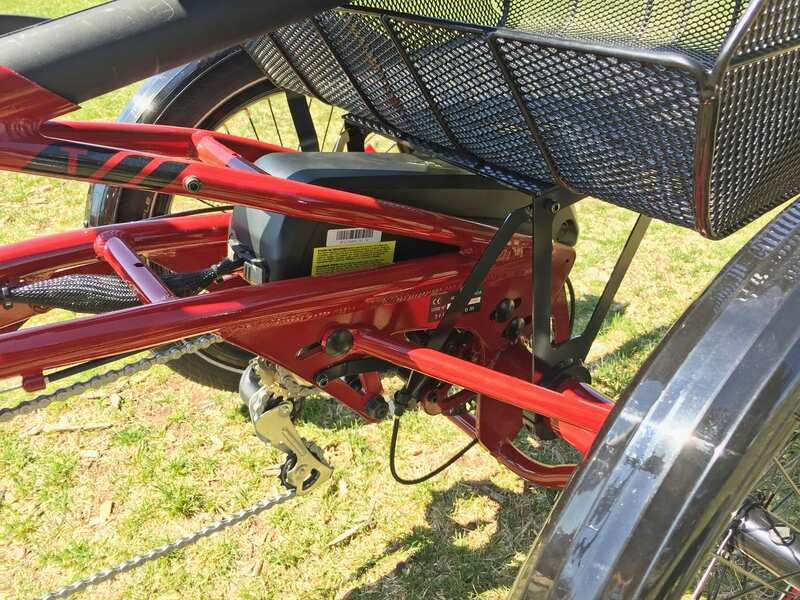 By moving the battery to the back of the bike, the center is clear for easy standover and reduced contact from the rider… but you can start to see how much of the bike weight goes towards the back of the bike vs. the front, where the motor is. I do like the size and design of the battery pack, it’s easy to remove from the frame and can be stored and charged separately, which is a huge deal for such a large ebike. I’d probably store this trike in a garage or shed, maybe outside if I didn’t have space. 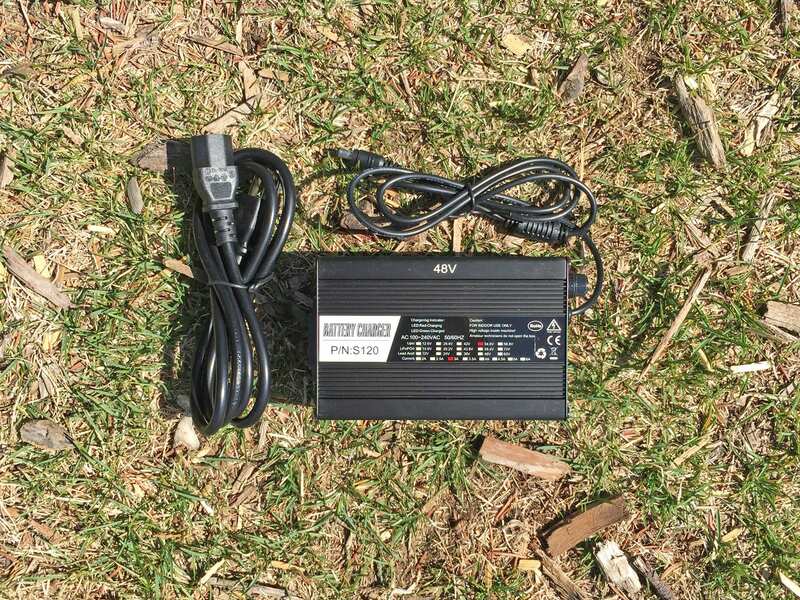 However, the battery will last longer if you keep it in a cool, dry location and always maintain at least 20% for long periods of disuse (try to stay well above 20% and below 80% for best results). 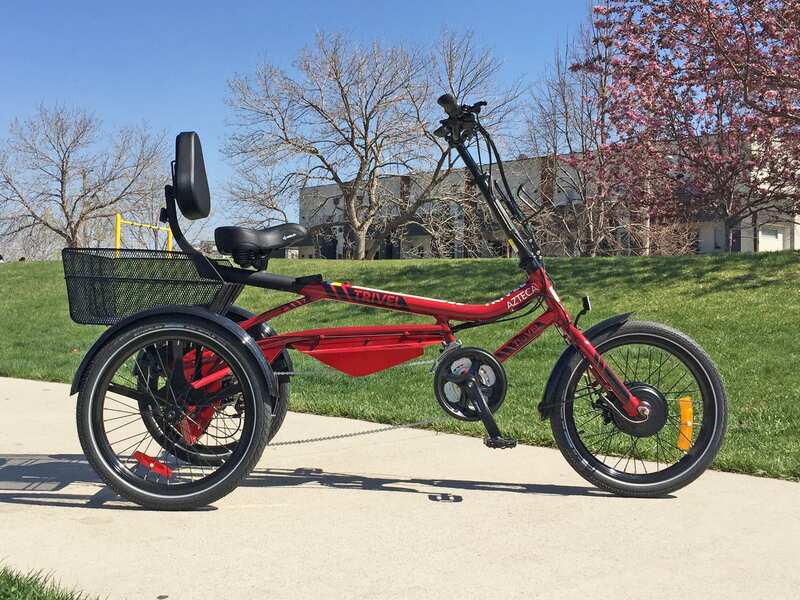 The battery slides onto the frame, is positioned low for improved balance, and doesn’t take up space in the rear basket like some other designs… but it definitely becomes harder to reach if you add the $50 basket accessory. 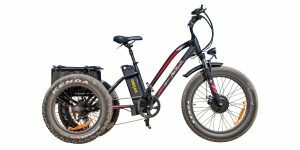 I don’t think there’s a double battery option available for this electric trike, but you could always purchase a second pack to stow in the basket, ideally in a padded bag, for longer journeys. Operating the control systems on this electric bike is very intuitive. You charge and mount the battery, then press the little rubberized grey power button on the button pad near the left grip. This button pad is fairly easy to reach, and has a set key to change views, as well as a plus and minus key to raise and lower assist. 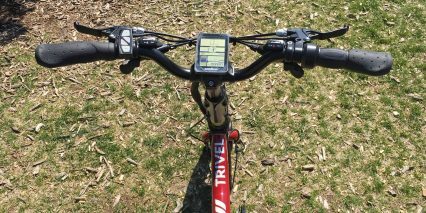 The LCD display unit boots up very quickly and lists all of the most important stats for riding, such as current speed, level of assist, and battery charge level. I really appreciate that the trike starts in level zero, because neither the pedal assist or twist throttle are active at this point. Given the zippy motor performance, it’s nice to know that you won’t accidentally take off if the throttle gets bumped when you’re simply trying to get seated. I do feel that the five-bar battery infographic leaves something to be desired in terms of range estimate. I see a lot of cheaper displays like this with 20% increments, and it can contribute to range anxiety. The display itself is not removable, and could take sun and water damage, as well as scratches at the rack and when folding, as a result. It could also be tampered with if you leave the battery on the bike. Someone could walk over, press the power button, click the plus key once to get into assist level 1 and then use the throttle to spin your wheel around… though I’m not sure why they would? 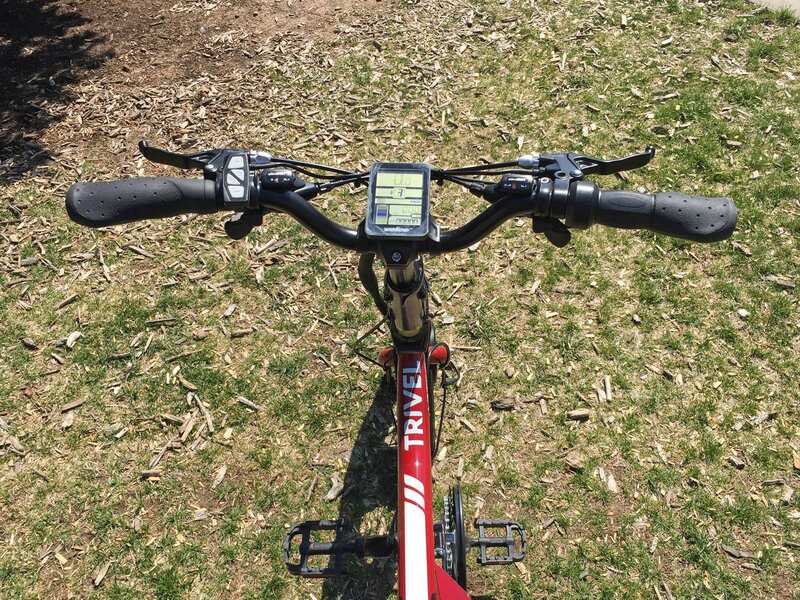 You can angle the display a bit, to reduce glare, and it is backlit, just tap the power button once on to activate and de-activate the light for nighttime use, but there aren’t any headlights, taillights, or USB charging ports on this electric bike. It’s pretty standard, and basically just gets the job done. I do really like how the throttle can override assist, because this allows for smoother starts and gives you a way to relax your legs on occasion. Always be careful to pick your legs up when throttling the bike and keep them up until you are completely stopped. 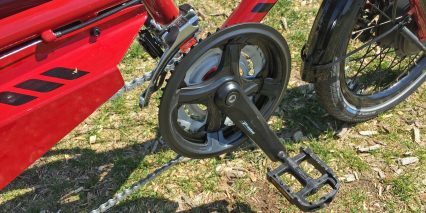 It’s possible to catch your foot under the pedal and sort of ride over your own leg on tricycles in some situations if you don’t have stronger muscles and are caught off guard. 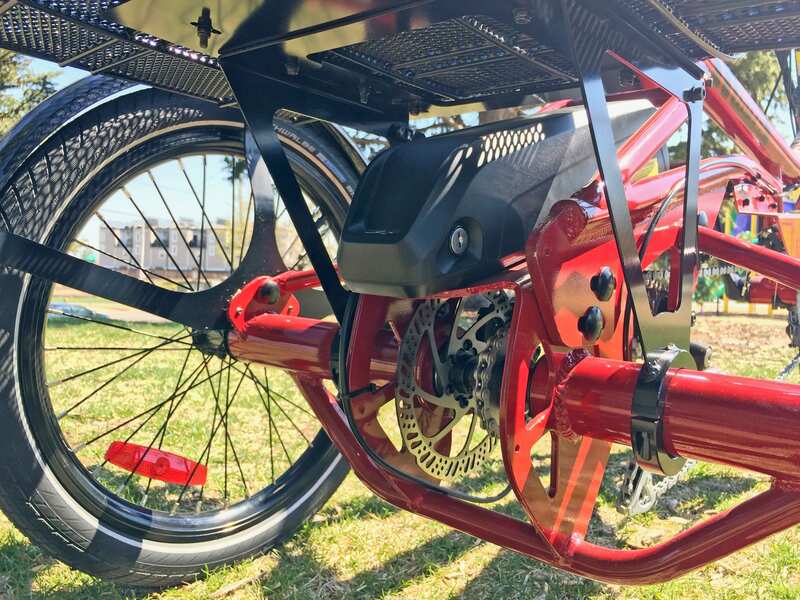 I want to call out that the Trivel electric trikes use sealed 12-magnet cadence sensors that are more responsive than average and that both brake levers have motor inhibitors built in to cut power instantly. This is very important given the size and weight of the product. 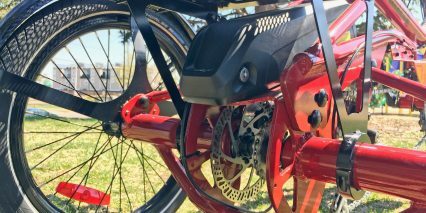 With 160mm mechanical disc brakes, you may have to use more hand effort than hydraulic, but they are easier to adjust for most owners. This is one area that would be a wonderful upgrade to see in the future, large 180mm hydraulic disc brakes would be a dream because the longer brake line to the rear brake wouldn’t suffer from as much friction and the brake levers could be adjusted in for smaller hands or riders with gloves. At the end of the day, $3.7k can feel like a lot to spend for an electric bike… but this is one of the few products that I have seen which offers a recumbent seating position and is sold through shops. For just $200 more, you can get the fat tire version… which is a blast to ride and can go off-road more easily, even handling some sand and snow if you lower the tire pressure. Remember, these are products that are coming from Canada, and the company usually specializes in custom builds… they have a long history of making bicycles, so hopefully that means you’ll get excellent support and replacement parts will be easy to come by. 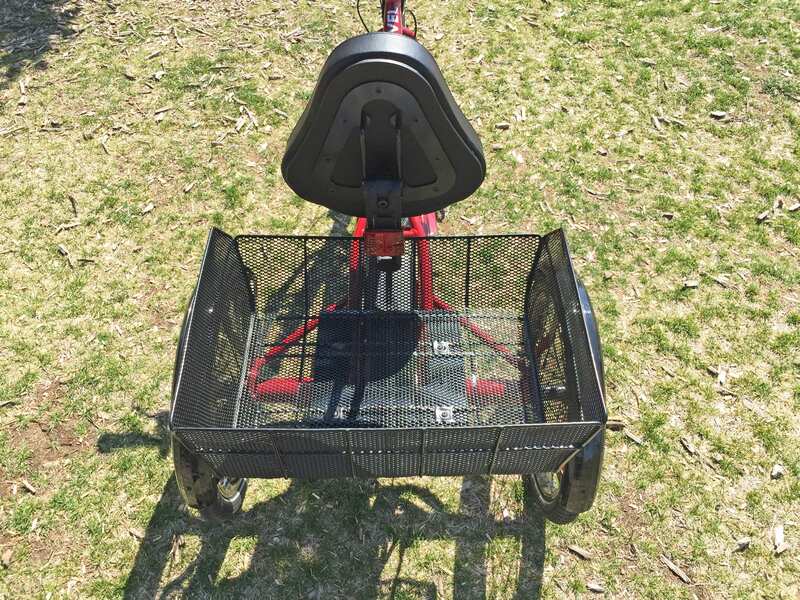 The basket accessory is very handy, and I appreciate that Trivel went with rubber-coated steel mesh so little items wouldn’t rattle around as much or get scratched and rusted as easily. 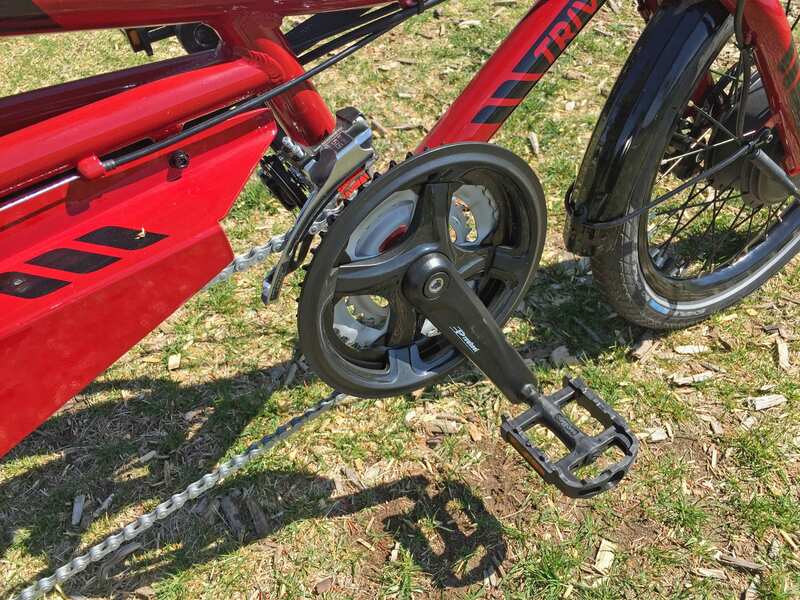 The trike feels stable, but does not come with parking brake pins on the brake levers, so it could roll away and probably tip over if you don’t chalk the wheels or put a cable or lock through the front wheel. Most trikes are stable when going straight but can start to tip onto two wheels when turning like this one, even at slower speeds. The longer wheelbase and lower passenger position here keep it pretty stable, but that might make you less visible to cars. 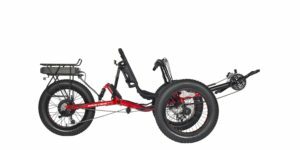 Consider adding light and a flag… or a lighted flag ;) you may also want to purchase a lightweight trailer to move the bike, and definitely take off the 7-pound battery before trying to lift it. 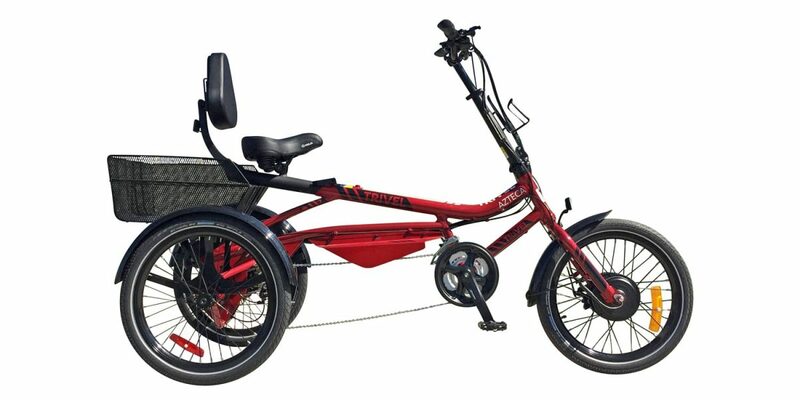 The trike is narrow enough to fit through many standard doors at 30.5″, but be careful not to scratch your walls and door trim when doing so… definitely keep the bike powered off when moving it. There are no quick release systems on the wheels here, but having all of the same inner tube and tire sizes is nice. I love that they managed to add a bottle cage mounting point along the top of the stem. 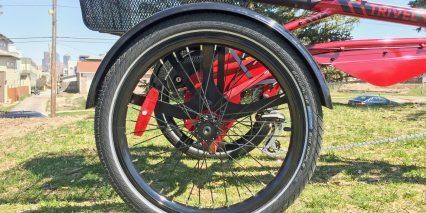 While reviewing these trikes, I got to speak with a woman named Karen who was buying the fat tire version, and she said that said she liked the product because of how adjustable and stable it was. 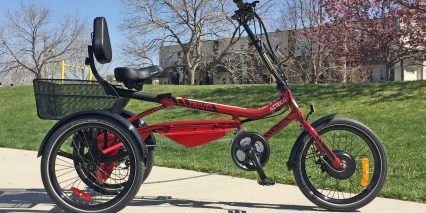 She also said that she would use it to visit the local hardware store, go grocery shopping, and ride on paths for recreation and exercise without fear of getting too tired to return home. 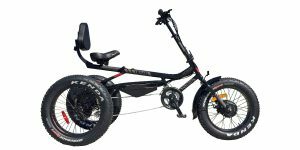 The motor would help her get up hills, deal with wind, and simply go further to explore new areas. 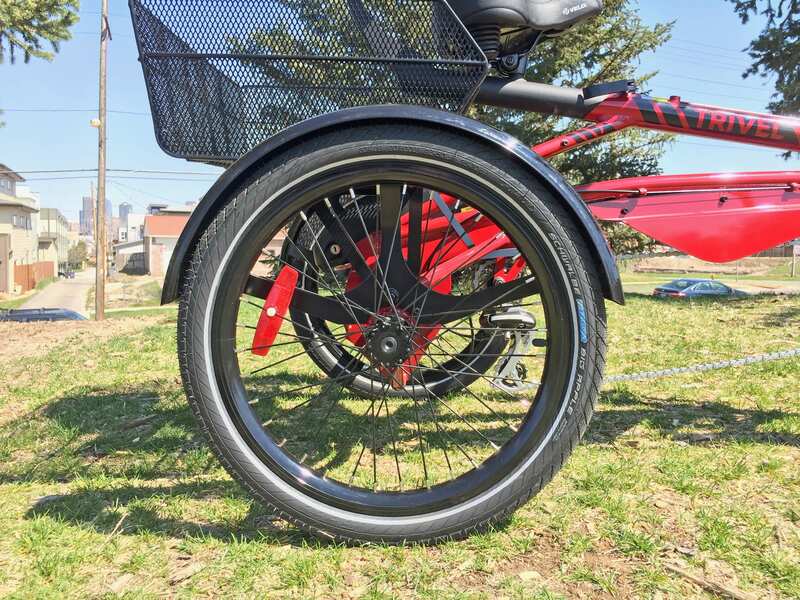 When you pedal this thing, the right rear wheel turns, and if you’re using assist, the front wheel also turns, so it’s like a two-wheel drive ebike in that sense. 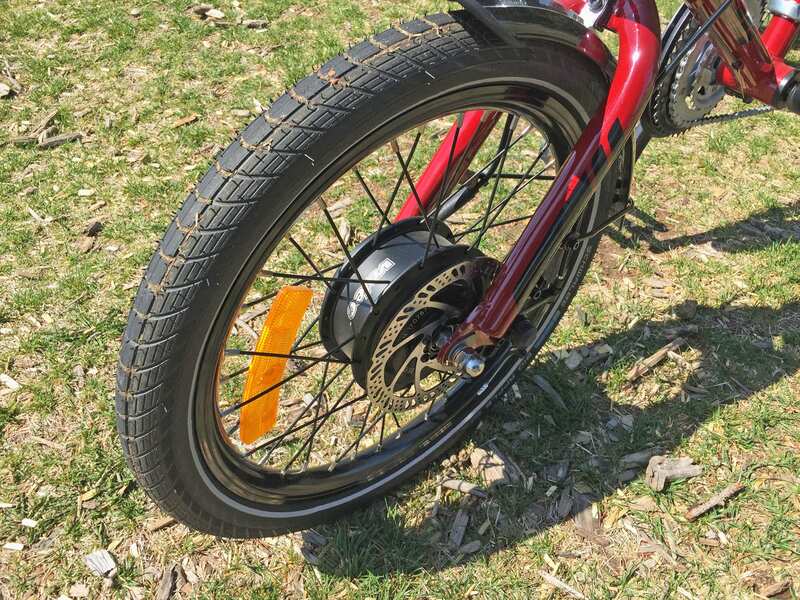 Note however, that only the right rear wheel turns and brakes, the left wheel spins freely at all times so that it can turn easily and have a less complicated drivetrain. 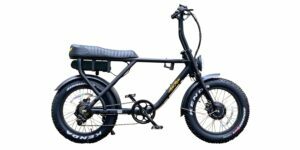 I want to thank Best Electric Bikes USA in Denver for letting me interview their customer and ride one of their bikes for this review. As always, I welcome your feedback and questions below as well as in the Trivel Forums, where you can post pictures of your trikes and what accessories work best (or how to best add them, like the flag).